I have never really delved into using a portable Bluetooth keyboard. For the most part if I need to type that much I will just take out my Chromebook. 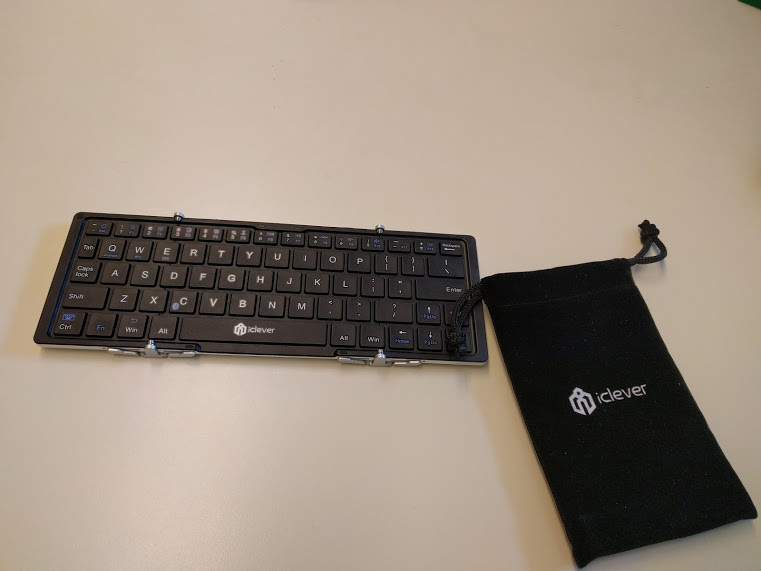 However, recently the kind folks at iClever sent me their Portable Bluetooth Keyboard to review and then give my honest thoughts on this product. Right out of the box, the device was just as described, light, small, and very portable. Thankfully, they included a really nice velvety (if that is even a word) pouch to store and carry the keyboard, as well as decent length USB-A cable for charging. Connecting the device was a bit clunky and actually took me a few tries with my Nexus 7, Nexus 6 and my Chromebook (just for fun). The user manuals explained that you needed to connect to the iClever Keyboard in your Bluetooth device list, however for me; it did not say iClever Keyboard until I tapped on the correct device identifier. Luckily the icon next to the MAC address was a keyboard so I was able to decide which one to select. Once connected, I fumbled around a bit to try to figure out what I could and could not do using a keyboard on a tablet or phone. Eventually I figured out how to navigate. The responsiveness was impressive and I noticed absolutely no lag time between using the keyboard and the device entering the text or command, which was a nice surprise for me. A little more about the device – As I mentioned it is small, light and even folds up so that it takes up less space in your bag. 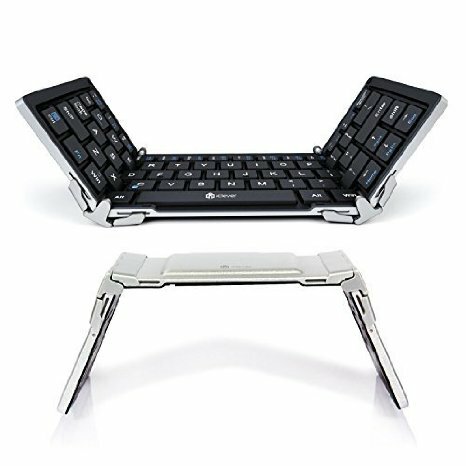 For me, I would really prefer to have a built-in stand with my keyboard so I could use it and look at the screen a bit better. Also, I felt the keyboard being so small made me use the hunt and peck method of typing a bit more than I would have liked. 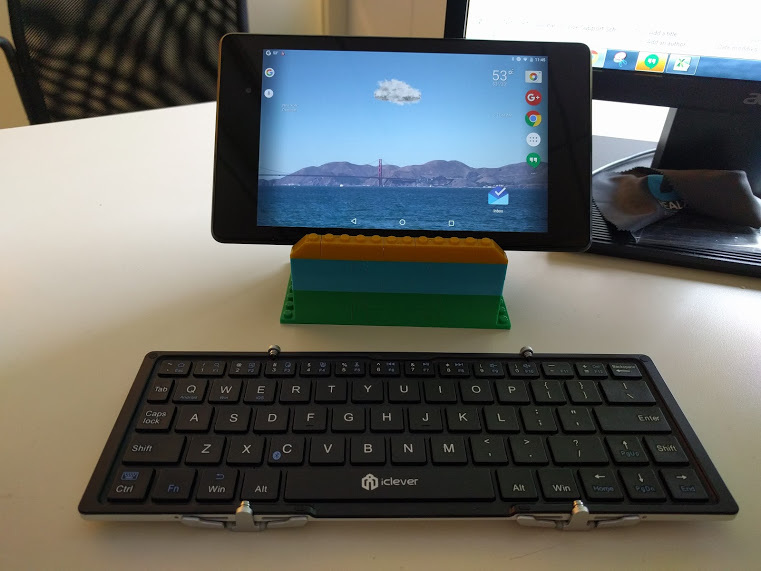 It’s a bit pricey given other similar devices that have built-in stands, such as the Battop Slim Wireless Bluetooth Keyboard we reviewed earlier this month. If you are interested in trying one out for yourself, please feel free to pick one up here on Amazon.